Home/Technology/Ok, Google. If you Want Us To Follow Your Wish Of Doing Voice Searches, We Are Ready. The world was already crazy for getting to the top of search engine results when mobile first indexing of Google came as a shock to website owners. 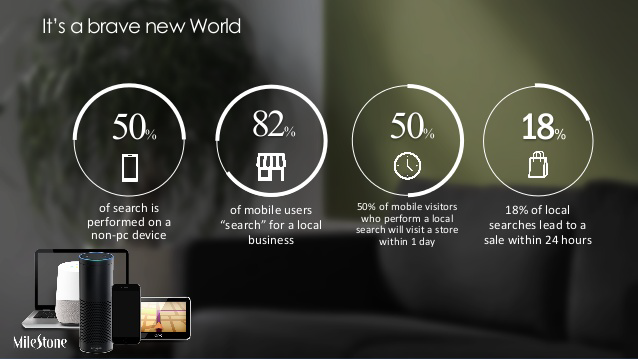 Adapting to the change, everyone joined the race to optimise for mobile devices. But as the competition was getting hot, another technological evolution came - voice search. The year 2017 was all about e-commerce, but the year 2018 is all about mobile indexing, voice search and AI. All tech giants are investing in deep to bring voice search assistants because they are seeing the exponential growth that voice searches will have in going 2 to 3 years. According to statistics, voice searches grew to 50 million from 0 in the year 2015 and are expected to occupy 50% of all searches performed all over the world by 2020. Wondering how? Consider Amazon's Alexa, Google's Google Assistant, Microsoft's Cortana, Apple's Siri, Yandex's Alice and Samsung's Bixby to help you with that. Voice assistants will become a trend. It will cause the users to shift from type search to voice search. At present 27% smartphone users are using voice search every day. The are three main reason due to which they do so. Out of these, 42% people do voice search while driving or travelling because they don't want to type. It gives them the opportunity of making hands-free searches while doing another activity. Also, out of all voice search users, 43% cite that voice search is faster than type search. And it is so very true. You can type 40 words in a minute but you can speak 150 words in a minute, making more searches in the same time span. 28% think voice search is a more reliable way of searching when there is an urgency. The voice search returns precise and relevant results, often narrating answers to the search queries via voice assistants. Understand that voice search will be done through two mediums. One is through the web browsers which ask you to speak and the other is through voice assistants. The former one is likely to have lesser users than the latter one because of the addiction that smartphones have created. Voice search is going to cause great changes in the world of searches, with sites trying to fetch traffic from typed search results witnessing a significant degradation in organic traffic even when the sites are very well optimised for relevant keywords. The reason is that people will not be performing typed searches in the future and the keywords for voice search will be totally different from the keywords for typed search. 70% of the voice search queries that were received by Google were naturally sounding questions and these are what should be the approach for voice search keywords. You will soon see digital marketing companies providing services for voice search optimisation. As more and more people will flaunt using their voice assistants, the online market will have more competition. The major challenge in voice search optimisation is voice recognition and natural processing. A lot of noise is recieved in voice queries which makes the recognition for devices difficult and so the results are not tailored. But don't get troubled! Voice search will not kill typed search because mobile phones could not kill the desktop. It would only create a divide between the users. Here is the starting of the new race! After all, there will be there will be 21.4 million smart speakers by 2020 and speech recognition error rate reducing to 8%.